After exploring more than 40 countries recreationally, Joe Reynolds decided it was time to turn his love of adventure into his day job. With just $5,000 he launched the first-ever Great Urban Race, a wild metropolitan quest, during which teams solve clues and complete mental and physical challenges while discovering their city in a fresh way. In five years, Reynolds, along with partner Ryan Kunkel, has parlayed his initial investment into Red Frog Events, a Chicago-based company with more than 60 full-time employees, three signature extreme races and a serious following. The company's most popular event, Warrior Dash, a 5K race packed with obstacles like a pond filled with logs, a rock wall, a tunnel of flames and a sinking mud pit, made appearances in 35 cities across the country in 2011 and drew 600,000 participants. This year the company is going international for the second time, taking its events to Ireland and Great Britain. Revenue has grown from $50,000 in 2007 to a projected $85 million in 2012. 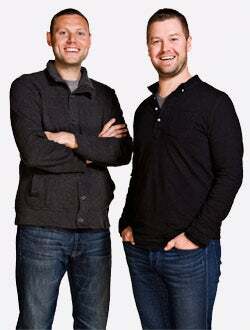 Racing ahead: Ryan Kunkel (left) and Joe Reynolds, founders of Red Frog Events. "We've had a tremendously successful start over the past four and a half years, but we continue to be excited about what will come next," Reynolds says. "When you're really passionate about your business, you can see lots of tremendous opportunities." Reynolds had previously owned a house-painting company, but he admits he had no idea how to contend in the event-production business. What he did know was that he loved competing and creating fun experiences--and he wanted to share his passion with the masses. With hard work and dedication, he's now doing just that. If, like Reynolds, you'd like to turn what you love into a viable business enterprise, start with these six tips. While enthusiasm is a great place to start, it's not enough to sustain your business for the long term. Before launching your business, do a reality check and make sure you have the other components needed for success, such as a willingness to work hard and a market for your services or products. "Sometimes passion can blind you to the potential downside of your idea," says John Torrens, a serial entrepreneur and an entrepreneurship professor at Syracuse University. "The one non-negotiable factor for any sustainable business is that they solve a problem for a specific customer segment in a way that is appreciably better than the next best alternative. Get as much feedback from potential customers as possible. No matter how great you think the idea is, you still need to understand what your market thinks." Be good at what your business does. "This is probably not an issue if the primary work of the business is your passion," White says. "But we have seen too many people buy a franchise or start a business only to discover that they didn't like or weren't good at the primary work of the business." Remember the details. There are tons of ancillary functions that go along with running a business that must be performed well for it to succeed. These may include ordering inventory, paying the bills, invoicing customers, keeping the books, sweeping the floor, marketing and selling. "You will need a plan for accomplishing these tasks," White says. "You can do them yourself if you have the inclination and the skill set. You can outsource them if the cash flow of the business will allow that. Or, you could take on a partner to perform some of the functions." Dole out responsibility. When the business grows, you'll have a choice to make: You'll either have to delegate the primary work to others, or you may choose to delegate managing the operation to someone else so you can continue to focus on the primary work yourself. Most new hires get a job at Red Frog Events through the company's internship program, and there are approximately 150 applicants for every internship position. "If you go through our application process and our internship program, we know you're passionate about the job, the company and about life," Reynolds says. 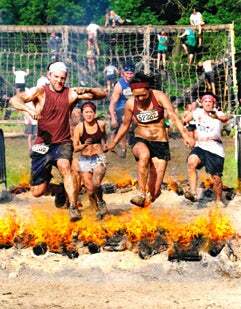 Extreme Heat: Warrior dash contestants run through flames, mud and other obstacles. Having employees who share your zeal for the business will help your company succeed. For instance, at the Warrior Dash Louisiana in 2010, a series of tornadoes tore through the landscape during the event. "We had to shut down mid-event and there were some moments of chaos," Kunkel says. But the storms didn't stop the race. Neither Reynolds nor Kunkel were in Louisiana, but the staffers who were managing the race stayed up through the night to repair the course and get all the obstacles ready again, so the competitors who weren't able to finish could complete the course the following day. By hiring others who share your devotion, you'll be able to trust the business to your employees as it grows, rather than insisting on having your hands in every endeavor. If you have a hobby, likely there are others out there who share that interest and would like to learn more about it. Sharing your knowledge can be a great way to build your business, says Katie Weber, who quit her job in 2001 to turn her feng shui hobby into a consulting business. She started by launching an e-mail newsletter, the Red Lotus Letter: Feng Shui for Wealth, which helped establish her name in the field. "People would forward my e-mails and I'd get new sign-ups," Weber says. "And at meetings, I could offer free content to anyone I met." After launching with 22 names in September 2001, Weber's e-zine has grown to more than 15,000 subscribers and earned her $200,000 last year. 4. Keep the passion alive. Once your business gets going, you can become mired in the daily tasks of running a company and watch your original excitement dry up. "Keep your passion alive by staying involved in the aspects you love most," says Alan Hall, founder of DooBizz, a free resource that offers online lessons in entrepreneurship. "Spending too much time on repetitive tasks you can delegate to others will ultimately dampen your enthusiasm and end up burning you out. Remember the elements you loved most at the start of your business, such as creating a new design or a product or meeting new customers in hobbyist groups, and make a conscious effort to include at least some of those activities in your ongoing role. Otherwise, your work will turn into a form of drudgery that may kill your passion for the original hobby." Reynolds and Kunkel make a point to continue competing in races themselves so they can maintain their love for running and recreation. That fervor that fueled the company's launch also allows the co-founders to free themselves from some of the pressures that often accompany entrepreneurship. Rather than feeling responsible for thinking of everything and micromanaging their employees, Reynolds and Kunkel empower their staffers to develop solutions to their own problems. Three times each year, every employee is encouraged to come up with a list of "bottlenecks," or things that hinder them from doing their jobs to the best of their ability. After the last round of bottleneck lists, Reynolds and Kunkel incorporated 40 immediate changes, such as altering a customer service policy and providing some workers with their own printers. Naturally, entrepreneurs who start businesses based on their interests find their business to be fun, but keeping it fun takes a bit of work, Syracuse University's Torrens says. "There's a palpable difference between companies that have a culture led by a truly passionate entrepreneur and those that use passion and fun as sales and recruiting gimmicks," he says. "In the authentically passionate companies, everything grows from that passion, including the people, policies, branding and community relations. That obsessive focus on whatever it is that gets you out of bed can't be faked, but it takes work to create the circumstances under which it can thrive. Maintaining primacy of mission and having the strength to stay on course and avoid distractions is critical." At Red Frog Events, Reynolds and Kunkel have worked hard to create a positive culture. Company perks include unlimited vacation days; full health, vision, life and dental insurance; regular free food and drinks (including beer on tap); and a summer-camp-theme office complete with a treehouse, tepees and a hammock. "Three times a year we shut down the office after lunch, unexpectedly, for a staff field trip," Reynolds says. "We play rooftop games like broom ball or take boat cruises on Lake Michigan. It's important to turn off the work mode occasionally and get to know each other and really enjoy the passionate people we have working with us." In addition to making work fun for employees, it's important to make your own job as the boss as enjoyable as possible. Reynolds and Kunkel get excited about new ideas and new product launches, so for them it's fun to hear their employees' fresh ideas for the company. Three times a year, they hold an internal business plan competition. "We get a flood of fresh ideas we could launch in the future," Kunkel says. "And it's fun for employees, too: The prize is free lunches for a month." When you start a business based on a personal interest, it can be easy to assume that the business must remain on the same track to maintain your dedication. But the most successful entrepreneurs understand that change is good and that there may be more than one way to meet your original goals. Reynolds launched Red Frog Events because he wanted to combine his love for adventure travel and competitive runs. But over the past five years, he and Kunkel have realized they are excited about producing recreational events in general, not just runs. This year they plan to enter the music festival industry, starting with their own Firefly Music Festival, which they hope will compete with some of the world's largest such events. "Every decision we make isn't for this week or next week or next year, but for 20 years down the road," Kunkel says. 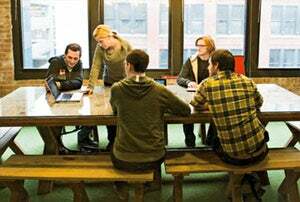 "Building a sustainable company requires ongoing reinvention and new development." They've experienced a tremendously successful start, and Reynolds and Kunkel say they're looking forward to what's next. Always open to new ideas, Reynolds says they're seeing a lot of opportunities for growth in different directions: "You have to be willing to stretch and grow in ways you may not have imagined at the beginning."